The rapid growth in e-commerce has facilitated Australia’s increasing domestic appetite for Internet-based trading and online shopping. Although recent online growth has been more subdued than the 20-30% annual growth rates recorded in earlier years, it is expected that growth will continue and volumes will remain high in the coming months and years. Industry expectations for rapid clearance, and ‘light-touch’ law enforcement intervention means Australian border agencies have to work harder and more effectively to facilitate legitimate e-commerce transactions while at the same time ensuring that regulatory, revenue collection, and community safety requirements are met. Increased occurrence of illicit transactions – as e-commerce volumes are increasing, there has been a significant rise in prohibited and restricted goods coming through the air cargo and international mail stream in particular, and there are an increasing number of online forums about the importation of a very broad range of goods, including contraband goods. In particular, the volume of drugs being seized is up, a phenomenon which can be explained by the combination of a significant increase in precursors and methamphetamine production globally, and a growing presence of the ‘DarkNet’ illicit trade environment. Poor information – major courier companies, utilized in connection with e-commerce, typically have their contract with the supplier, not the importer, and often do not make contact with the imports before seeking to clear the goods. Also, goods descriptions provided by suppliers are often poor, and do not facilitate easy assessment to identify risky consignments. To address some of these issues, Australia’s Department of Immigration and Border Protection (DIBP) has undertaken a number of actions, including working ahead of the border and the supply chain, in order to prevent import of prohibited goods into the country. This approach has included having companies prevent the purchase of certain products if there is an Australian delivery address for the purchaser. In one case, this practice enabled the avoidance of about 900 seizures per month. Simply put, the DIBP has used the cost/benefit model to industry that results from the application of its compliance continuum. To date, the absence of electronic item level information in the mail environment, combined with the changing nature of the mail supply chain, has meant that the application of a sophisticated, pre-border risk assessment model for mail has not been possible. This means the DIBP’s ability to identify and intervene in mail that poses a potential risk relies on manual intervention of these items in real-time at the border. Current risk assessment processes for mail remain highly manual, resource-intensive, and are performed in real-time at the border. This approach is becoming increasingly unsustainable, given increasing mail volumes and a tight fiscal environment. 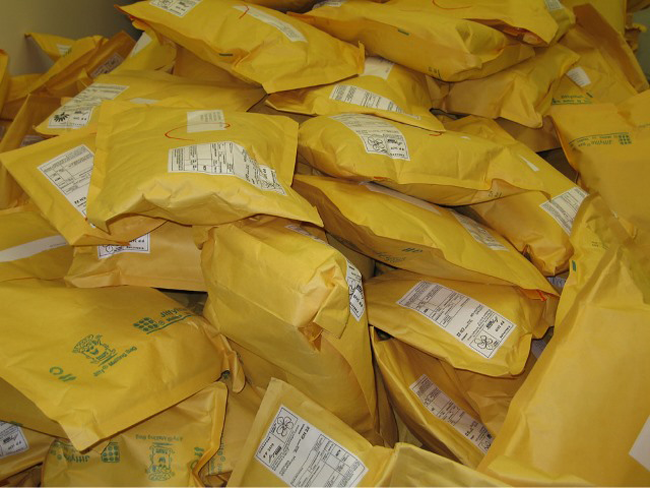 As a result of commercial responses to the growth in e-commerce, such as postal operator moves to offer enhanced e-tracking options, electronic item-level information for certain mail items is now becoming available for the first time for certain types of mail, particularly express mail service (EMS) items – EMS is the international express postal service offered by member postal administrations of the Universal Postal Union), and parcels. Due to the possibilities for criminal entities to exploit vulnerabilities in the international mail environment, and the fact that the current system is becoming burdened with growing mail volumes, the DIBP is in the early stages of exploring the application of electronic reporting of mail items. Australia would welcome any initiative that provides access to electronic data for mail, as the current lack of any transactional data for international mail and the lack of data integrity for air and sea cargo significantly constrain its ability to target key border risks at, or ahead of the border. how to better focus intervention resources on high-risk goods, and more efficiently facilitate legitimate mail items. review of Australia’s ‘low-value threshold’ (the de minimis threshold). In recognition of the growing availability of commercial electronic information in the international mail stream, under the DIBP’s reform agenda, a team was established in November 2013 to explore the potential border intervention opportunities that electronic information may provide. The focus of the team during its period of operation was to undertake a work programme to position the DIBP to be able to leverage electronic item-level information as it becomes available, and to strengthen the intelligence-led approach to mail. The team explored operations in the context of a future international mail environment that considered electronic reporting in the mail stream, more efficient and effective risk assessment for both electronically and manually reported mail, technologies that support the ability to track goods and enable the DIBP to link individual items to electronic information, and improvements to existing border processes at the mail gateways. In mid-2014, the Australian National Audit Office (ANAO) released an audit report Screening of International Mail, which identified a number of findings relating to the DIBP’s interactions in the mail stream. This includes the updating and refinement of a number of Instructions and Guidelines associated with risk management, as well as the introduction of a revised sampling programme anticipated to take effect in mid to late 2015. The combined measures should provide a sound framework to ensure Australian consumers benefit from the reduced costs, wider choice, and faster delivery times associated with e-commerce, while at the same time ensuring government objectives are met in terms of economic growth, national security, and community safety. Australia currently has a low-value threshold (LVT) in place which exempts most imported goods valued at 1,000 Australian dollars (AUD) or less from both goods and services tax (GST) and Customs duty. The Australian Government has recently announced a number of changes as part of its tax reform. It is drafting legislation to ensure greater consistency in the application of GST to also include digital products and services. GST collection will also be broadened to cover overseas online transactions (physical goods) under 1,000 AUD. It is proposed to implement a ‘vendor registration model’ as a method of collecting GST for the Australian states and territories. As goods would not be stopped at the border, administering such a model would have a relatively low cost. Non-residents (overseas suppliers) will be the ones who charge, collect, and remit GST for digital and physical products. Only vendors with an Australian turnover of 75,000 AUD will need to register and charge GST. The Commonwealth of Australia will draft legislation for the application of the new arrangements from 1 July 2017.